One of my most memorable experiences. July 1974, I guess near Banff, Alberta. Without expectation or warning, our campsite was suddenly in view of a green glow off in the night sky over a ridge. We had no idea what it was. Suddenly, green streaks began emanating across the sky … then pinks, yellows … then they began to move like big jello globs of color up in the sky. We were mesmerized. Once it was figured out what they were, we spontaneously began cheering and clapping. Of all the beautiful sights of nature I have ever looked upon, this was the most magnificent. Two years earlier, I was camped in northern Ontario and slept through them in my tent. Then, while working for the PO up in Connecticut, our office won tickets to a Whalers/Flyers hockey game out in Hartford — about 1989. On the return trip to Sharon, CT., we saw the lights again. Not as spectacular that second time, but pretty enough. Catch ’em, if you can!! Oh, what a night! We were camped, I think just outside of Banff National Park in Alberta, Canada, just off the road somewhere. We pitched tents and were settling in as darkness was falling. Correct me if I am wrong Mindy Shulman O’Neil and Robert Greenberg, but I believe you two were going off to fetch some water – maybe returning [hey, I’m getting old & this was July, 1974!!] – when all of a sudden, Mindy was nailed in the head by a flying rock – source never determined?. She was cut quite badly and you guys headed off to find medical services in Rob’s car. Not too clear on those details because I wasn’t actively involved. It was an inexplicable event … and then … The rest of us, myself, my then girlfriend, Doriel, and good friends Butch, Joanne, Sue & Steve were hanging around camp doing whatever it was we were doing. Over a ridge of mountains, we began to see a green glow in the sky. What the heck? We had no clue what was out there. The Emerald City of OZ maybe? Then, on occasion, streaks of green would emanate from that glow across the northern skies. Then yellow; then pink. Again, what the heck? Never had any of us seen anything like this. What was going on. Impressed, but unimpressed, I retired to my tent. It was not long before I heard yelling, “Come out here”! I rushed out never in a million years expecting the sight that awaited me. The sky had virtually exploded into ever-shifting masses of colors – mostly greens, & yellows, and pinks. It was awe-inspiring and just kept on for hours – until daylight, actually. We sat there for hours – straight as arrows – watching this seemingly endless light show in the sky. At some point, Mindy & Rob returned – Mindy patched up and relatively OK – and took their seats in the audience. Spontaneously, we actually broke into cheers & applause. To this day, it is the most memorable and breathtaking natural wonder I have ever witnessed. It was intense, and though I was fortunate to see this again years later, it was not the same. What was this phenomenon? 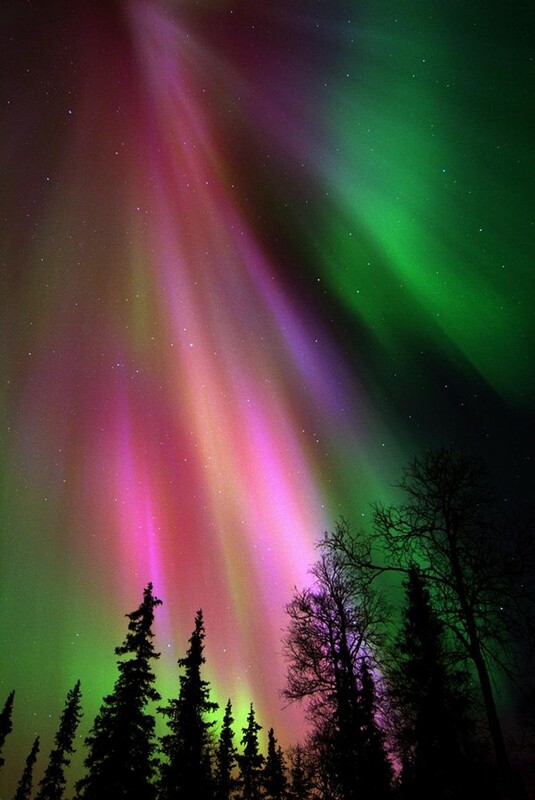 Why, the Northern Lights, of course! Ah, the beauty & wonder of Nature!